Timex and Core77 have collaborated to introduce one of the world's smallest watches. 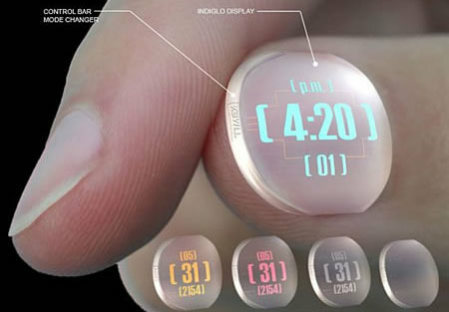 This unique, wearable gadget is disposable timepiece designed to mould to your fingernail and with its light up function makes a bold fashion statement. The Timex Nail Watch has not officially been released on the market, so there's not yet any information regarding availability in stores or price point. This unique wearable gadget won Timex's 2154 The Future of Time Competition based on its innovative watch design. The miniature watch is translucent, and designed to fit the average fingernail. The display of the watch includes the time, date and AM/PM indictor which appears in clear format until lit up. This strange watch for your fingernail becomes even trendier at nighttime, as each design lights up in a different color when the tip of the fingernail watch is pressed. Wearable gadget fanatics and the fashion forward can consider wearing a tiny watch on every fingernail, with each watch programmed to a different time zone around the world. Since watches are disposable, they're not designed to last forever; but no word yet on whether or not they are practical for an active lifestyle, since no information has been released regarding whether they will be waterproof or water resistant once available on the watch market, or how securely they will stick to your finger nail. Admittedly, the Timex Nail Watch indeed makes a geeky fashion statement; but is this a trend that we will see entering the world of fashion? Wearable gadgets like watches don't have to be limited to the wrist after all, do they? "Top 10 Strangest Watches - Wacky?" "Ten High-Tech Wristwatches That Any Geek Would Love"
"8 Ugly Watches That Might Tell The Time"
Could Plastic Roads Be A Sustainable Alternative? A disposable watch? Are we really that much of a disposable society? Best thing they ever did was put a clock in a cell phone. I dumped my wristwatch over a decade ago and will never wear one again. Disposable watch...what a waste. I assume they're dispossable because they can't keep re-adhering to your fingernail. It's definitely not the most enviromentally friendly option, especially if they contain batteries. But I think it's still a pretty cool idea! yeeeeaaahh! its that time again! LiTe It Up! otherwise you would have to throw it away every time you use the restroom!? THINK!